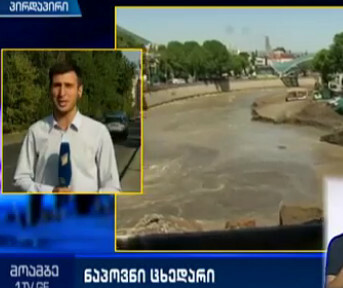 TBILISI, DFWatch–A dead body has been found in the river Mtkvari, increasing the number of confirmed deaths after the June flood to 20. Two people are still missing. Moambe, the news program on Channel 1, reported that Elizbar Baghashvili, 56, has been found. The body was first brought home to the family and later sent for an autopsy. According to relatives, the body was found in the river Mtkvari near Ortachala. The water level of the river is lower than usual. But later the same day, an Interior Ministry spokesperson told Interpressnews that the body was found in Mtkvari on August 23 and identified by DNA test. The analysis has taken time and it was only yesterday that the body was identified. Baghashvili had come from Moscow to Tbilisi to see his friends. He was in a taxi on the way home the night when the disaster struck. There are now 20 officially confirmed deaths because of the flood, while two – Sergo Kapanadze (31) and Beka Buturishvili (35) – are still missing.